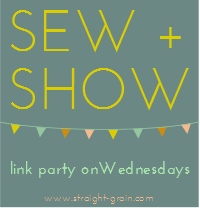 kicking off week two of guest posts for vintage may is a good friend, jess of running with scissors! i knew of jess’ blog before we competed together in project run & play (due to her awesome dino tails, which took blogland by storm a while back) but i became a big fan of hers during our season, where she sewed some really amazing garments – check out this suit! jess’ designs are often heavily influenced by history and she is especially great at designing for boys, so i asked if she would do a boy look for vintage may. 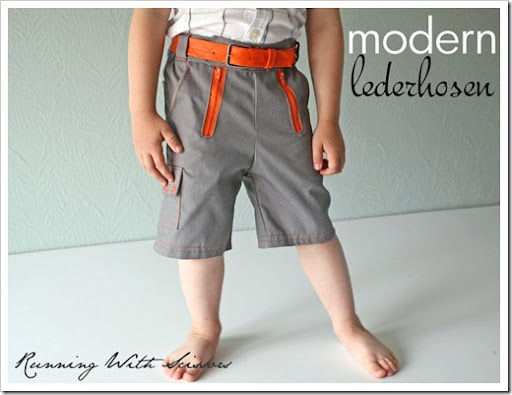 jess came up with this fantastic modern take on lederhosen and a tutorial for you to make your own! as a gal with german heritage, these make me especially excited. check it out! 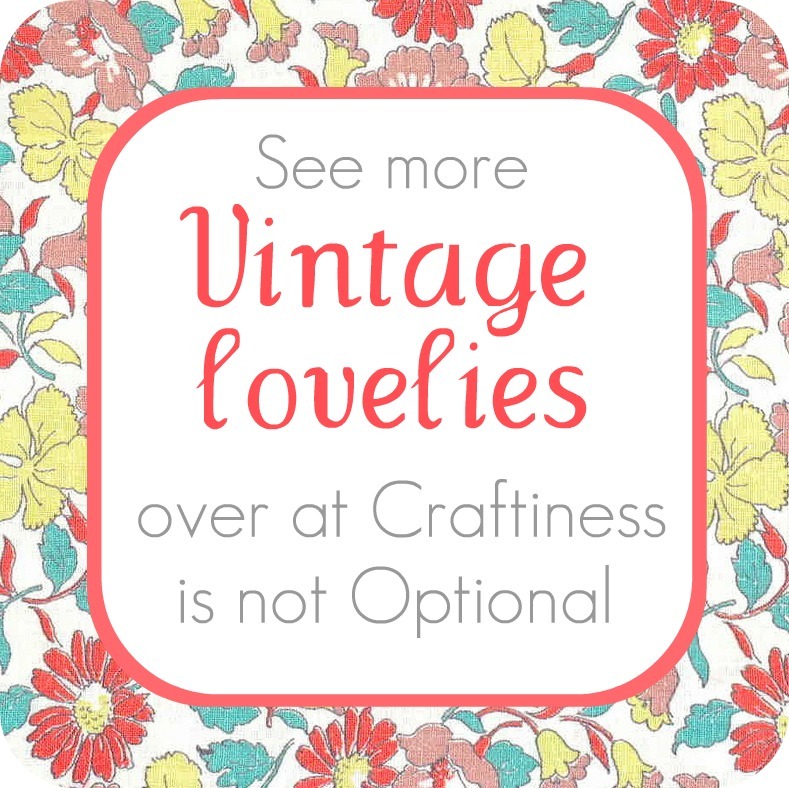 I’m excited to be here participating in Vintage May! I love looking to vintage or even historical clothing for inspiration, and trying to take the old fashioned styles and make them modern. It’s a challenge for me to design clothing with the influence of the vintage piece, but make something that doesn’t look like a historical costume. 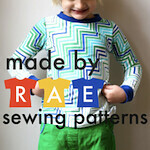 I also love to sew for boys! So how I was inspired to make modern lederhosen. 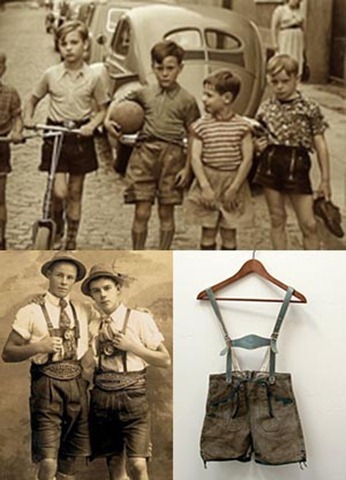 My neighbor is German and immigrated to the United States as a child, and was showing me a pair of heirloom leather lederhosen her brothers and sons wore. They were so cool, over fifty years old, and had metal exposed zippers for the side front closure. So I pinned quite a few lederhosen for inspiration and got thinking of ways to take a traditional Bavarian short design and make it modern and hopefully cool. So I designed a pair of knee length shorts with the double exposed zipper front, slant pockets, and a side flap-patch pocket. The front of the shorts unzip into a front panel. 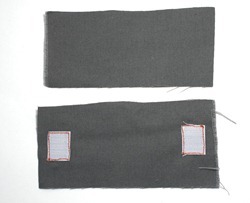 To secure the front panel to the rest of the shorts, Velcro attaches at the waistband. 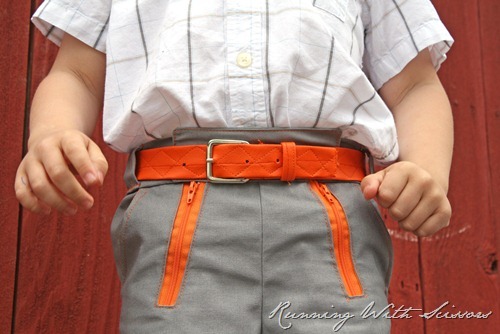 I thought Velcro would be easier for little guys to get them on and off rather than two snaps, buttons, or hook/eyes. 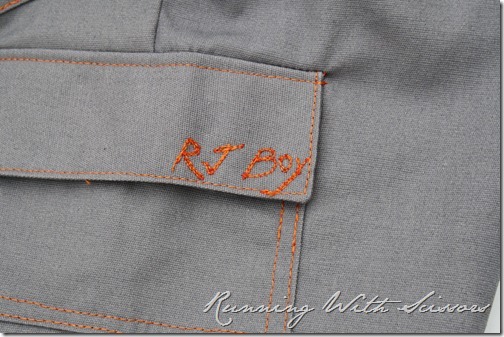 I added my son’s nickname “RJ BOY” to the front of the flap on the side pocket, and you can see the contrasting orange stitching that I used throughout the shorts. 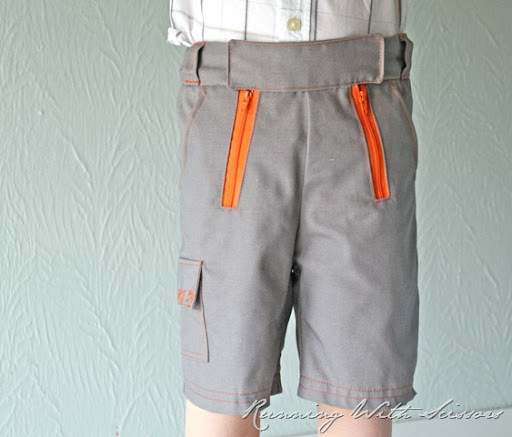 I also included standard back pockets on these shorts, as boys need lots of places for their treasures. 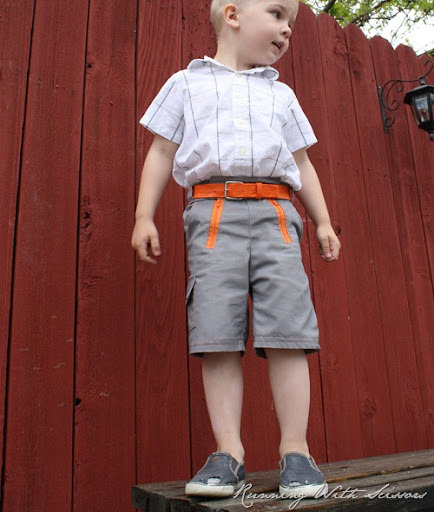 Here are the shorts as is, and below with the orange vinyl belt I made him. 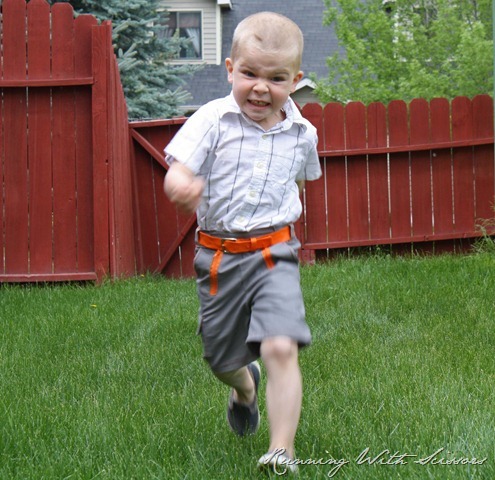 We found the shorts were perfect for running and playing, and he liked how easy they were to get on and off himself. 2. Sew Front & Back Center Seams With right sides together, sew the curves for the front center seam and back center seams. OPTIONAL: Add back patch pockets at this point to back half of shorts. Add slant side pockets to front at this point if desired. Tutorial here for front pockets. 3. 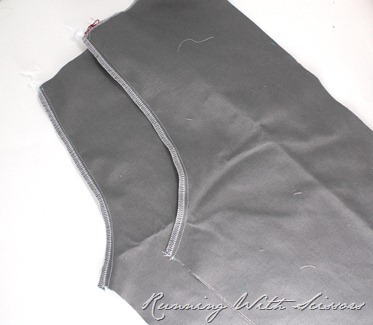 Prepare Zipper Holes On wrong side of shorts front (photo is right side), mark 1.5” away from center seam at top. 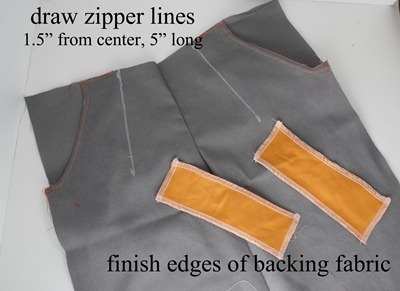 Draw angled lines where your zippers will lie, 4 to 5” long. 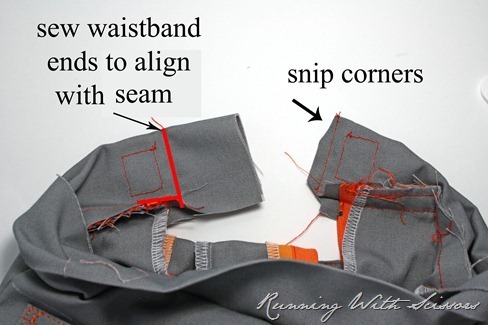 Prepare the backing fabric strips by finishing all four edges with a zig-zag, serge, or hem. These will be inside the finished shorts. 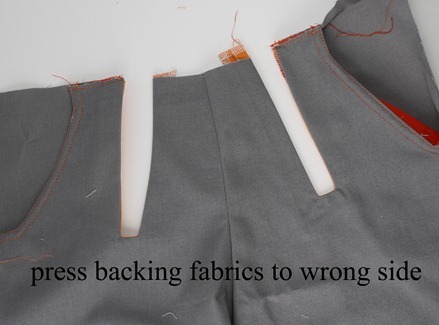 Place the backing fabric on the right side of shorts, lining it up with zipper marks. 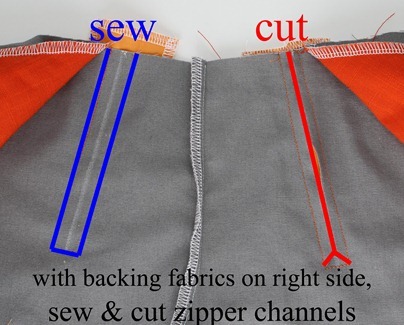 On wrong side of fabric, sew down, across and back up zipper marks with 1/4” seam allowance, making sure to sew through backing fabric. 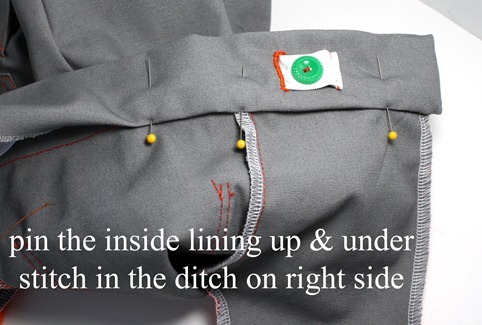 Cut down your drawn zipper line, then snip into each corner at the bottom. Once sewn and snipped, fold backing fabric to wrong side of fabric and press flat. 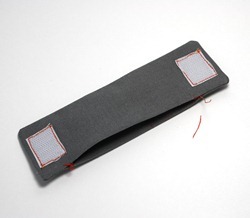 This creates a channel for zipper, using the backing fabric to turn right sides under. 4. 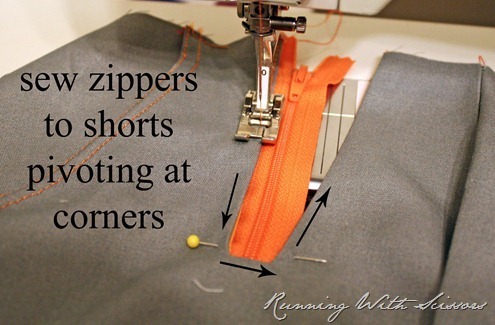 Sew In Zippers Pin the zippers to back of shorts front, centering teeth in open hole. Sew down one side, across, and up the other side using 1/8” seam allowance. Repeat on other side to have both exposed zippers in place. 5. 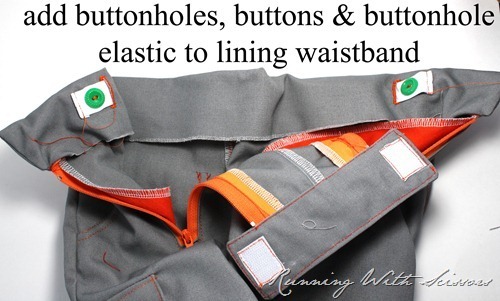 Make Front Waistband Take front waistband pieces (6.5”x2”) and on one waistband strip sew velcro centered vertically and 1/2” from ends. 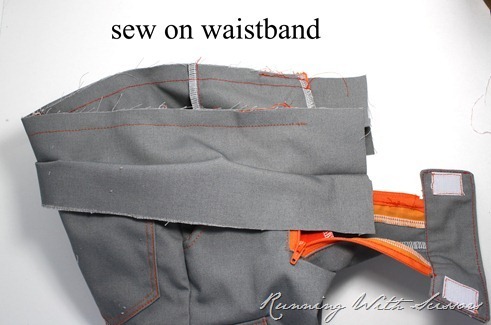 Place second waistband strip and sew with right sides together with 1/4” seam allowance all around edges, leaving an opening the width of your center front portion (zipper to zipper) on one long side. Snip corners. Turn waistband right side out, pushing out corners. Press flat, folding the hole’s seam allowances up and inside. 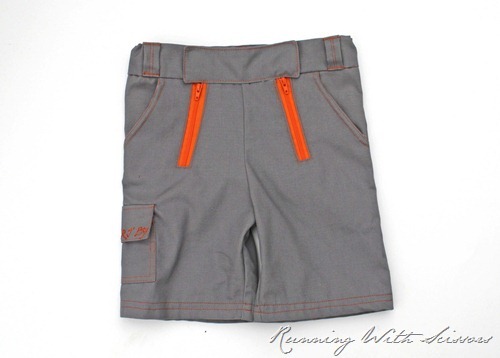 Slide waistband on the center front, making sure the velcro side is facing the inside of shorts. 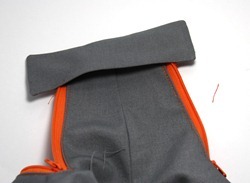 Top stitch around front waistband, securing it to shorts front. 6. Construct Shorts Sew shorts front to shorts back, sewing the side seams and inner leg inseams, right sides together. 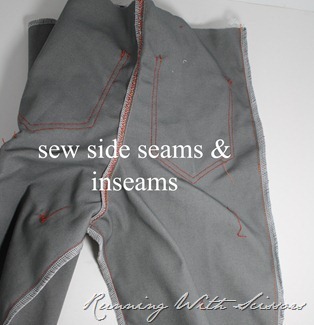 Optional: If you want to add a cargo flap pocket, sew that side seam first, open the shorts, attach pocket and finish the other side seam and inner inseams. 7. Attach Back Waistband First press the waistband in half. 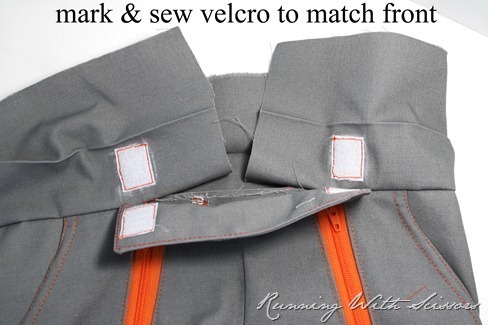 Take back waistband and sew around the back of shorts, zipper around to other zipper. 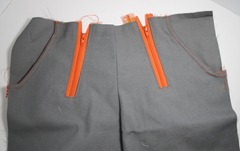 Fold waistband up, zip up shorts and use the front velcro to mark where the back velcro on the waistband should be sewn. 8. Finish Back Waistband Fold the raw ends of the waistband right sides together, and sew vertically 1/2” from velcro edge, then pivot at bottom corner to sew into pants/waistband seam. Snip the corners and turn waist band right side out, pushing out corners of waistband tabs. 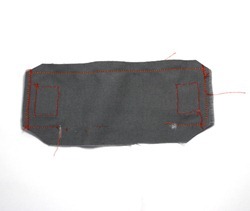 At this point you can add buttonholes to the sides of the inner waistband. I like to sew buttons beyond the buttonhole, then insert the buttonhole elastic and sew the end down just beyond the button in case the button pops off the elastic won’t snap back in the pants. 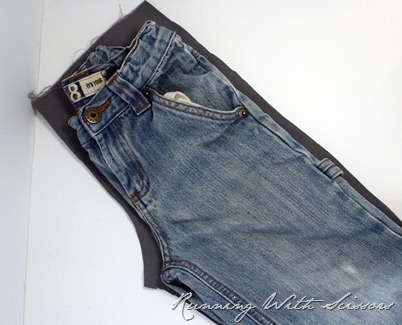 Finish waistband by folding raw edge up 1/4” and pinning to shorts/waistband seam. 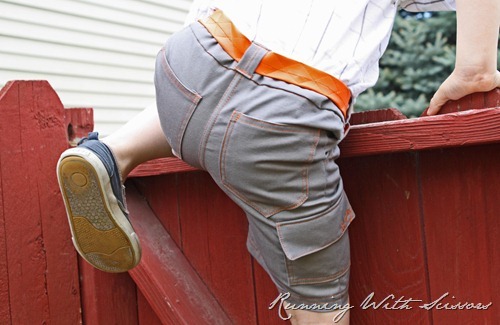 I like to sew the waistband down on the right side of the shorts, stitching in the ditch of the seam to hide the sewing. 9. Hem You can hem your shorts and you’re done! oh that RJ, he is definitely rockin’ those shorts! way cool. thanks so much, jess! 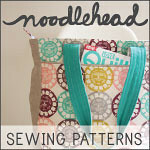 be sure to check out jess’s pattern shop here, she’s got some great stuff in there. 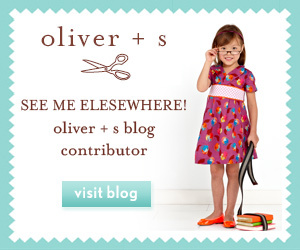 head on over to CINO for an adorable summery dress tutorial by anneliese of aesthetic nest! What a beautifully easy to follow tutorial. As a beginner sewer I really appreciate tutorials as clear as this. Thank you!!! These are amazing! You did a great job capturing the vintage look but making them modern. Your goal was definitely accomplished. These would be great for a wedding I think, comfy but structured and a bit formal. Jess – these are seriously AMAZING! You just blew my mind, I mean really though. 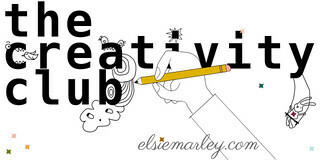 These are so inventive and amazing, I cannot even believe it! Having lived in Germany for 3 years, I have seen my share of lederhosen – and I cant even begin to tell you how much these would sell over there. Just amazing! These are so awesome! I definitely need to make a pair for my boy, to go with a dress I made for my daughter. AMAZING! Thank you so much for sharing this tutorial. What a fun idea! I agree, this is a perfect combination of vintage with modern aesthetics. Very cute! these are fantastic! 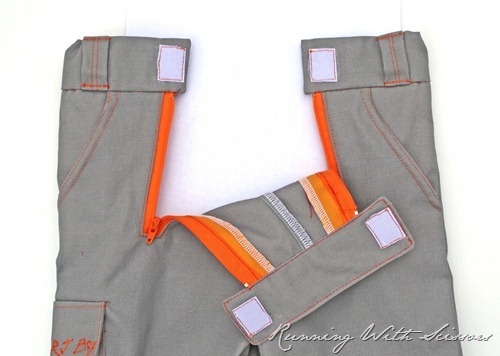 I love the orange and grey together, and the exposed zippers are awesome! Esa cremallera doble expuesta es una belleza.Gracias por enseñarla. Love this! This would be cool for grown ups too. Love jess’s work and I’m a frind of lil’ sis Lynette!